With over 50 years of experience Oswicks offers a wide range of property consultancy services for clients in Essex and surrounding counties. Our team of locally based estate agents and surveyors are skilled in providing swift solutions on residential, commercial and public sector buildings. 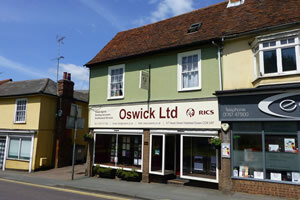 Free open market valuations on residential, or commercial property; including land, for freehold sale, rental and leasehold sale on the open market, Oswicks offer estate agency services across Halstead an Read full description...With over 50 years of experience Oswicks offers a wide range of property consultancy services for clients in Essex and surrounding counties. Our team of locally based estate agents and surveyors are skilled in providing swift solutions on residential, commercial and public sector buildings. Free open market valuations on residential, or commercial property; including land, for freehold sale, rental and leasehold sale on the open market, Oswicks offer estate agency services across Halstead and Essex. When marketing your property we undertake a market appraisal, produce particulars with professional photographs, erect a sign, forward the details to our list of prospective purchasers, undertake viewings at convenient times for both parties and negotiate the best possible price for you. All our properties/land are advertised on Rightmove and in regional newspapers. We offer low percentage rates, or agreed fees for a fixed term when selling, or renting your property. As a buyer we did not have these so N/A. They were standard but they earnt them. Oswick Ltd's fees are very reasonable, especially as their photos are done by their own exceptionally good photographer. Very reasonable (and lower than our previous agent was asking). All tenants with their name on the tenancy agreement or lease will need to be credit checked. The non-refundable fee including VAT is £50 for this service which will need to be paid in advance per tenant. We are committed to providing a professional service to all our clients and customers. When something goes wrong, we need you to tell us about it. This will help us to improve our standards. If you have a complaint, please put it in writing, including as much detail as possible. We will then respond in line with the timeframes set out below (if you feel we have not sought to address your complaints within eight weeks, you may be able to refer your complaint to the Property Ombudsman to consider without our final viewpoint on the matter). â¢ We will send you a letter acknowledging receipt of you complaint within three working days of receiving it, enclosing a copy of this procedure. â¢ We will then investigate your complaint. This will normally be dealt with by the office manager who will review your file and speak to the member of staff who dealt with you. A formal written outcome of our investigation will be sent to you within 15 working days of sending the acknowledgement letter. â¢ If, at this stage, you are still not satisfied, you should contact us again and we will arrange for a separate review to take place by a director. â¢ We will write to you within 15 working days of receiving your request for a review, confirming our final viewpoint on the matter. â¢ If you are still not satisfied after the last stage of the in-house complaint procedure (or more than 8 weeks has elapsed since the complaint was first made) you can request an independent review from The Property Ombudsman without charge.